Hearts head coach Robbie Neilson is paying little heed to the departure of manager Ally McCoist from Championship challengers Rangers. McCoist was placed on "gardening leave" on Sunday evening, with assistant manager Kenny McDowall taking over. "I didn't pay a lot of attention to it to be honest," was Neilson response to the change at Ibrox. "Things have been going on there (at Rangers) for a long time but it doesn't really affect us." 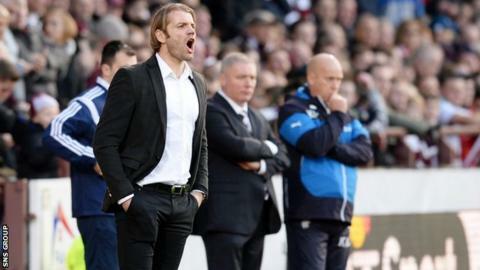 Hearts, unbeaten on league duty this season, can increase their lead over Rangers to 12 points if they win at Cowdenbeath on Tuesday and that is Neilson's sole focus. "I am just preparing for our game tomorrow night," he added. "That is the main thing for us. "Things have been happening there for a long time and it is a difficult environment to be in but it has no influence at all on what we do here." Hearts have midfielder Morgaro Gomis available for the trip to Central Park after suspension. Osman Sow and Kevin McHattie remain on the sidelines while Soufian El Hassnaoui is again expected to miss out but Dale Carrick is pushing for a comeback. Cowdenbeath, who won 2-1 at Queen of the South on Saturday, will be without Declan Hughes, who has returned to St Mirren following the end of a loan spell. Calum Gallagher looks set to join Kenny Adamson, Dean Brett and John Armstrong on the home team's injured list. "Everyone has taken a lift from Saturday's result and performance and we will look to build on that," said Cowdenbeath boss Jimmy Nicholl. "We won by attacking and despite all the strengths that Hearts have we aim to attack them as well."